The greatest challenge facing mankind is the challenge of distinguishing reality from fantasy, truth from propaganda. Perceiving the truth has always been a challenge to mankind, but in this age of disinformation, it takes on a special urgency and importance. Daily we must decide whether the threats we face are real, whether the solutions we are offered will do any good, whether the problems we’re told exist are, in fact, real problems. Every one of us has a sense of the world, and we all know that this sense is in part given to us by what other people and society tell us; in part generated by our emotional state, which we project outward; and in part by our genuine perceptions of reality. In short, our struggle to determine what is true is the struggle to decide which of our perceptions are real and which are false. Today one of the most powerful religions in the world is environmentalism, the religion of choice for urban atheists. We know a lot more about the world today than we did forty or fifty years ago and what we know is not so supportive of certain core environmental myths, yet the myths refuse to die. The environmentalist vision of yesteryear, when man lived in harmony with nature is a pipe dream, it never existed. It was a time when infant mortality was 80%; when four of five died of disease before the age of five; when one woman in six died in childbirth; when the average lifespan was 40; when plagues swept the planet, killing millions. The people who crossed the land bridge to the Americas set about wiping out hundreds of species of large animals and they did this in several thousand years before the white man even showed up. Their condition of life was hardly loving, peaceful or harmonious with nature. The warlike tribes of this continent are famous: the Comanche, Sioux, Apache, Mohawk, Aztecs, Toltec, Incas, etc. Some of them practiced infanticide and human sacrifice. The Maori of New Zealand regularly committed massacres. The Kyaks of Borneo were headhunters. The Polynesians created a society so hideously restrictive that you could lose your life if you stepped in the footprint of a chief. The New Guinea highlanders were still eating the brains of their enemies well into the 20th century and the African pygmies had one of the highest murder rates on the planet. This romantic view of the natural world as a blissful Eden is only held by people who have no actual experience of nature. Take a trek through the jungles of Borneo and you will have festering sores on your skin, bugs all over your body, biting your head, crawling up your nose and into your ears; you’ll get infections, and sickness and if you aren’t with someone who knows what they are doing, you’ll starve to death. The truth is almost no one wants to experience “real nature.” What people want is a week or two in a cabin in the woods with screens on the window, a simplified life with all the creature comforts. This environmental religion has been preaching overpopulation for over 50 years even as all the predictions of the total world’s population have been decreased, even as we hear about the coming world economic crisis from a shrinking population and the impending crisis of an aging population. For years we listened to the voices of doom – we are running out of oil, we are using up our natural resources, over 60 million will die from starvation, the ocean is rising from melting glaciers, we are destroying animal life, half the animal life on earth will be extinct by 2000, ad nauseam. Wouldn’t you think that with so many past failures environmental predictions would become more cautious.? But like the nut carrying the placard that predicts the end of the world doesn’t quit when the world doesn’t end on the day he predicts, he just changes his placard, sets a new doomsday date, and goes back to walking the streets. I know you haven’t read any of the facts I am about to give you because newspapers literally don’t report them. I can tell you that DDT is not a carcinogen and should have never been banned. I can tell you that the people who banned it knew it wasn’t a carcinogen but banned it anyway even though the ban has caused the death of tens of millions of poor people in third world countries, mostly children, whose deaths are directly attributable to a callous, society that promoted the new cause of environmentalism by pushing a fantasy about a pesticide. I can tell you that second hand smoke is not a health hazard, never was and that the EPA has always known it wasn’t. 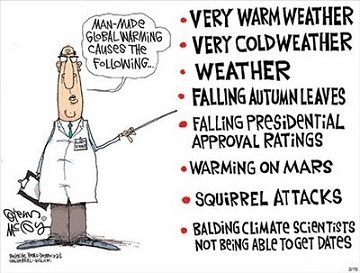 I can tell you that the evidence for global warming is far weaker than the left would have you believe. I can tell you that the percentage of US land area that is taken up by urbanization, including cities and roads, is 5%. I can tell you that the Sahara desert is shrinking and the total ice of Antarctica is increasing. I can tell you that a blue-ribbon panel in Science magazine concluded that there is no known technology that will enable us to halt the rise of carbon dioxide in the 21st century – Not wind, not solar, not even nuclear. I can give you factual basis for these views and cite the appropriate journal articles posted in the most prestigious of science journals. But it probably won’t impact more than a handful because the beliefs of this environmental religion are not dependent on facts. Is it possible to get environmentalism out of the clutches of religion and back to a scientific discipline? Yes but we must institute far more stringent requirements for what constitutes knowledge in the environmental realm. I am thoroughly sick of politicized so-called facts, facts that aren’t just exaggerations, but are lies. When we allow science to become politicized we are lost. We will enter the Internet version of the dark ages, an era of shifting fears and wild prejudices, transmitted to people who don’t know any better, and that is not a good future. It is time to abandon the religion of environmentalism and return to the science of environmentalism. It is time to base our public policy decisions firmly on that and nothing more. Source: Remarks to the Commonwealth Club by Michael Crichton, physician, producer, director, screen writer and author, best known for his books, The Andromeda Strain, Jurassic Park and Twister. You can read his speech in full at this link. ← Intelligent Design – Why are the Intelligent So Afraid of It?